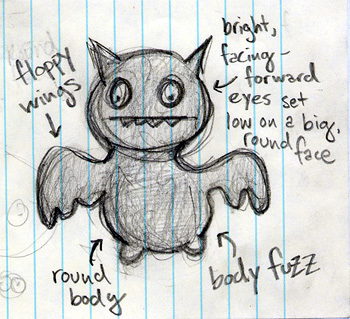 You are here: Blog / Notes on writing and drawing / WHAT MAKES SOMETHING CUTE? Scientists who study the evolution of visual signaling have identified a wide and still expanding assortment of features and behaviors that make something look cute: bright forward-facing eyes set low on a big round face, a pair of big round ears, floppy limbs and a side-to-side, teeter-totter gait, among many others. Cute cues are those that indicate extreme youth, vulnerability, harmlessness and need, scientists say, and attending to them closely makes good Darwinian sense. As a species whose youngest members are so pathetically helpless they can’t lift their heads to suckle without adult supervision, human beings must be wired to respond quickly and gamely to any and all signs of infantile desire. Yeah, I know that was a crappy graphic. I’m away from Photoshop at the moment, and I couldn’t stand the crappy graphic any longer, so I put up a scan straight from the sketchbook. The infographic that ran with the article was pretty crappy, too. Holy crap that infographic is ugly. Way for them to completely discredit their own assertions. yeah it was pretty bad. so bad that I didn’t want it uglying up the page! Lasseter’s googly bug eyes at Disney are so tiresome. So few emotions can be expressed, all of them over the top. No subtlety Glad to see a post about this issue. Part of the cuteness of Icy Bat is also the tiny pin dot pupils. When the eyes are allowed to be only suggested, rather than fully rendered, more of the full range of the observer’s emotional response can come into play. Glad to have ‘stumbled upon’ your website. Indirectly linked from a Google Alert on sustainability. That’s cool.